The Galaxy Note 9 is still several months away, but many concept designers have started sharing renders of what the phablet could look like. 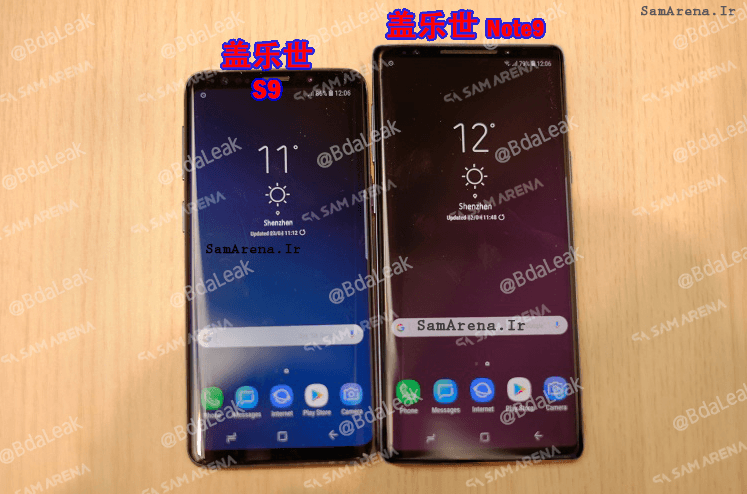 An Iranian publication has gone a step further and shared the first live Galaxy Note 9 images. The pictures offer a detailed look at both the front and back panels. 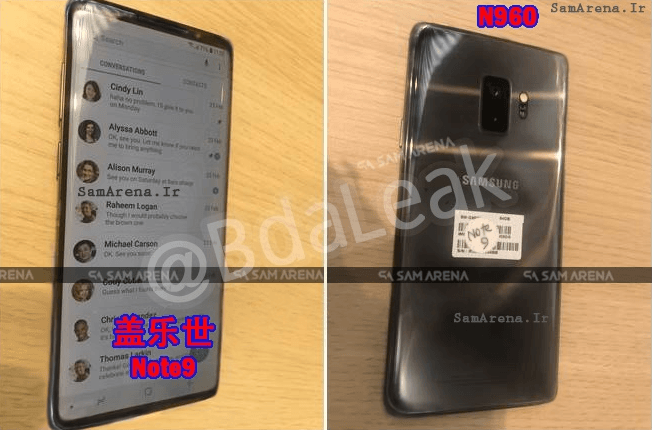 The Galaxy Note 9 images surfaced just days after the handset with model number SM-N960U was spotted on the Geekbench benchmarking site. Iranian publication SamArena has published pictures of what they claim to be a Galaxy Note 9 with no rear fingerprint sensor. It means the fingerprint scanner is embedded under the display, allowing users to unlock the device and authenticate payments by placing their finger on the screen. But it’s too early to say whether the final version of Note 9 would sport an in-display fingerprint scanner. KGI Securities analyst Ming-Chi Kuo recently told investors that Samsung was still facing “technological difficulties” with the optical fingerprint sensor. Kuo said the company was unlikely to include the feature in the Note 9. But The Investor later reported that Samsung Display had developed 3-4 solutions to place the fingerprint reader under the display panel, and Samsung Electronics was “seriously” considering one of them for the Note 9. The Galaxy Note 9 images show that the phablet has a wider earpiece than the Galaxy S9 Plus. The dual-tone LED flash also appears larger and more circular than on the S9 Plus. These differences, coupled with the lack of a rear fingerprint sensor, suggest that the pictures shared by SamArena are not the Galaxy S9 Plus prototypes. The phablet retains the physical Bixby button, a curved Super AMOLED Infinity display with an 18.5:9 aspect ratio, and a metal-and-glass design. The Iranian publication also shared a photo of the S Pen stylus that would ship with the Note 9. The stylus appears similar to its predecessor, except that the physical button has become more rectangular. Samsung executives have indicated in the past that the S Pen stylus would get a major upgrade with the Note 9. The Galaxy Note 9 images show the device wrapped in plastic, which should make it difficult for someone to fake the photos. But folks at SamMobile claim that the photos shared by SamArena are fake. According to SamMobile, the pictures are taken directly from different Galaxy S9 Plus hands-on articles. SamMobile discovered it with a “reverse image search on Google.” Of course, the images are Photoshopped to make them believable. SamMobile added that Samsung might not even have a working prototype ready yet. So, how could the live images leak out so early? We will have to wait for another few months before the reliable and believable photos of the Note 9 start appearing online. The device is rumored to look similar to the S9 Plus with an S Pen stylus. The rumor mill claims the Note 9 would feature a 6.38-inch Super AMOLED Infinity display, at least 6GB RAM, 64GB of base internal storage, and a 3.5mm headphone jack. It would be powered by the Exynos 9810 or Snapdragon 845 chips depending on the market. It is said to pack a huge 3,850mAh non-removable battery with fast-charging and wireless charging capabilities. Samsung’s mobile business head DJ Koh said recently that the Note 9 would come with an upgraded Bixby 2.0 AI assistant. The Korean company has already started developing firmware for the Note 9. Samsung is developing two Android firmware builds: N960FXXE0ARB7 and N960FXXU0ARC5. One is for the Snapdragon version of the Note 9 while another would run the Exynos variant. The Note 9 firmware development started a couple of weeks earlier than Samsung began firmware development for the Note 8 in 2017. The company might be planning to release the Note 9 earlier than usual. Last month, Samsung trademarked the “Note 9” phrase in Colombia. The trademark filing says the “Note 9” moniker is associated with smartphones and consumer products. Support pages for the Note 9 were recently spotted on the company’s official websites for South Africa and North Africa. Unfortunately, the support pages did not reveal any specifications. A new report coming out of South Korea claims that Samsung is planning to launch the Note 9 earlier than usual, most likely in July or early August. Samsung had high hopes from the Galaxy S9 and S9 Plus, but these handsets aren’t selling as well as the company hoped. The company wants to launch the Note 9 earlier to ensure that potential buyers do not switch to other brands. Also, an earlier Note 9 release would give it more time on the store shelves before the iPhone X successors arrive.